No prizes for guessing the story of the day, especially when the papers (and prime time TV) can barely contain their excitement. In editorial comment newspapers criticise “parivar politics” but don’t mind devoting reams of newsprint to the latest Gandhi dynast. Times of India devotes its flap and two inside pages, Hindustan Times two pages. Economic Times a full page, The Indian Express over six reports and The Hindu five reports — generous by Hindu’s conservative standards. In Telegraph style, Express heralds Priyanka Gandhi’s political debut with: “Rahul gets sister organisation”. HT and Economic Times pun on the “hand” — ‘Priyanka is now hands on’ (HT), ‘Cong ropes in Priyanka to get the Upper Hand’ (ET). Telegraph, itself, asks, “How’s the Josh, bro?” alongside a very loving brother and sister photograph. TOI wins the prize for a tongue-twister headline: ‘With poll Mahakumbh looming, Priyanka takes political plunge on its flap.’ It also covers Priyanka Vadra’s ‘social life’— “chic and warm”. The Indian Express believes Priyanka is Congress’s “X factor”. “Her entry is bound to enthuse Congress workers across the country,” it writes. TOI thinks “A Priyanka-aided revival of the Congress would appeal to Brahmins, which could hurt saffron prospects” and give them “a third option”. Jyotiraditya Scindia, appointed general secretary alongside Priyanka, is ignored on the front page but for HT’s ‘Will give it my best shot: Scindia new west UP incharge’. Do Indian lives matter? “Six India sailor killed, six missing after 2 ships catch fire in Kerch Strait” finds space on Page 11 of the Express with a banner headline, while TOI gives it a small column on Page 1. The new interim finance minister Piyush Goyal made the front page. TOI says the arrangementis a “clear indication that finance minister Arun Jaitley…will not present the Modi government’s last budget”. ET lead story recalls that “this is the second time Goyal has been assigned the finance ministry” — the first being when Jaitley had kidney transplant last year. Although obscured by Priyanka Gandhi, Justice Madan Lokur’s opinion of the SC collegium system is on Page 1 of the frontline papers. Express says he “breaks silence”, Hindu diplomatically writes, “Collegium best system, but needs tweaking: Lokur”. TOI is the more direct: ‘Lokur: Judge picks should’ve been notified’. All emphasise his “disappointment” that the apex court’s resolution to elevate two judges in December “was not put up in the public domain” (Hindu). TOI in ‘Priyanka’s Launch’ sees the “risk-averse” Gandhi family “finally pulling out all the stops”. Congress has noted that the LS elections “will be a do or die battle for it”, it writes. Express headline ‘Another Gandhi’ says it all for the edit. 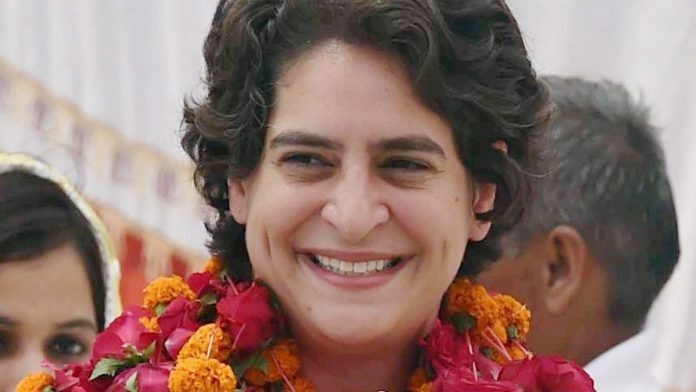 It writes that Priyanka must “brace for a question the new aam voter is asking of Rahul: What have you done so far….The language of entitlement has diminishing returns today… (Priyanka) will be watched closely, unsparingly’’. ET’s ‘Priyanka Will Spur Cadre’ believes that “the family’s grip” on Congress’s “imagination” goes beyond the party with media and social media “focus” on her elevation. Her entry, along with Scindia’s means “The GOP wants (UP) to know that Congress has fresh ideas … different from poverty and conflict…This will spur the cadres”. Business Standard’s ‘The temptation of dynasty’ agrees that the move “might conceivably enthuse the party cadre” but argues that “dynasties are not good for democracy”. It was the Priyanka Gandhi show Wednesday as English and Hindi news channels discussed and disputed her entry into ‘active’ politics (NDTV 24×7), all day long. Delighted to have someone else to talk about than Modi and Rahul, especially if that someone was “charismatic” ‘Neta Priyanka’ (India Today, News X), news channels alternated between a soft focus on her personality — ABP recounted her touching encounter with Nalini convicted in the Rajiv Gandhi’s assassination case — and hard questions on this “desperate” move by Congress, as BJP’s Shazia Ilmi put it (Times Now). And then there was dynasty: ‘Can Congress think beyond dynasty?’ asked CNN News 18. On Republic, Arnab Goswami began on an unusual note by hosting JD (U) Vice President Prashant Kishor. What did he make of Priyanka’s entry, asked Goswami, adding that Prashant had worked with Congress in UP and suggested this move earlier. But Goswami was disappointed with Kishor’s “celebratory tweet” as he called it, welcoming Priyanka to politics. “You should hate dynasty,” he said. “What are her qualifications?” he asked repeatedly. Kishor did not answer the question. BJP spokesperson Sudhanshu Trivedi put it rather well: from ‘Indira lao desh bachao’ the perception had changed to ‘Priyanka lao and Rahul Bachao’. On Times Now, Rahul Shiv Shankar asked questions the BJP had raised: Rahul is “nervous… not confident”, “he has played his hands wrong”, Priyanka is there to save “a few eggs” in the UP basket. “Nice try,” observed Renuka Chowdhury of the Congress, “this is war…we roll out our ammunition when we want to”. India Today’s Rahul Kanwal was in Davos for the World Economic Forum meeting but joined the Priyanka debate by interviewing Madhya Pradesh Chief Minister Kamal Nath. On Zee News, anchor Sudhir Chaudhary felt Congress had now played its final trump card in Uttar Pradesh. Aaj Tak anchor Sayeed Ansari said that Congress has launched its Brahmastra with Priyanka’s launch. We welcome Priyanka Gandhi’s appointment as General Secretary . Her entry into active politics will energise cadres and be a catalyst for the rising fortunes of the Congress Party .